Slightly elevated view of Island Lodge, with a front porch on the left, and a screened-in porch on the right. Lucy Rumsey Holt and Arthur Dana Wheeler are sitting inside. Trees are in the background. Caption reads: "The Lodge, 1907." The caption to a similar photo in Album 6 reads: "Island Lodge. 1907. L.R.H, A.D.W. By Mr. Thiers." This photograph was taken by Mr. Tiers. Island Lodge on Archibald Lake, built in 1898, was the summer home of Lucy and W.A. Holt. 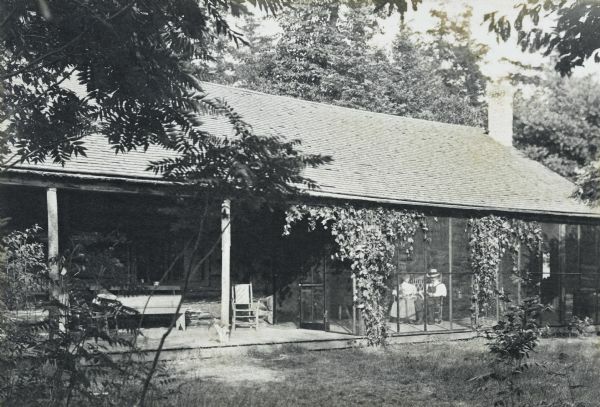 The lodge was "...constructed on the model of a logging camp; sleeping quarters were located in the west wing, eating and lounging quarters located in the east wing, and the two connected by a midway." The lodge was built using unpeeled hemlock logs and chinked with moss. Source: Holt, Constance W. & Holt Jr., Donald R. (1968). "Place Names." This unpublished manuscript is part of Holt Family Albums collection. According to Sharon Ann Holt, great granddaughter of Lucy and W.A. Holt, "Island Lodge is a testament to the work of skilled woodworkers."